Whether you are an adult or child, you should be entitled to make certain decisions for ourselves. These could be the food you eat, the clothes you wear or the toys, games etc that you want to play with. The underlining idea is that those choices should ultimately be yours to make. I'm honestly sick to death of all of the arguments and debates that I see plastered all over the news and social media on the constant, the government telling us what we can and can't do, people trolling the internet quick to tell us we are wrong in how we do certain things. I mean the latest uproar about Jamie Oliver putting in his two pence about breastfeeding, quite frankly who the feck cares, is what he's saying really going to deter/help you in the method you choose. Whether your child begins their life being breast or bottle fed shouldn't matter as long as they are healthy right? So what if your son wants to wear pink or play with princesses, that's their choice and it does not and will not define who they are as a person and won't make them any less of a boy. I played with transformers and Teenage Mutant Ninja Turtles when I was younger but let me tell you I am most definitely still a female. Then there's the whole obesity "issue". This gets my back up. I remember when my eldest started school I got a letter home telling me she was borderline obese, if you've seen my daughter you'll know she is the size of a bean pole. Did I pay any attention to this letter, no I didn't, do you know what I did with it, I threw it in the bin. I know my children eat well, yes they have sweets and chocolate but they also have fruit and veg too. Sugar taxes etc don't help matters. If people want to eat sugar they are going to do it regardless of the cost and again that is their choice to make. And lets not forget that this putting all "larger" people in the same box. We are failing to remember that people come in all shapes and sizes and aren't necessarily bigger because they sit eating junk food all day, that's just their natural body shape. And we wonder why people are forever left feeling ashamed of the way they look. The fact that so many people get their knickers (or pants) in a twist over these matters is beyond me and it baffles me how half of these become news worthy in the first place. Yes everyone is entitled to have their opinion on whatever they like just like I am having my say now but ultimately one persons thoughts on anything shouldn't affect any decisions you make unless you decide you want it to. Even this post you are reading has no baring on anything at all, really it's just me as an individual ranting. At the end of the day we only get one life, and it should be up to us how we want to live it. How will we learn if we never get the chance to make mistakes, we won't always make the best decisions but it shouldn't be up to others to tell us whether we are right or wrong. 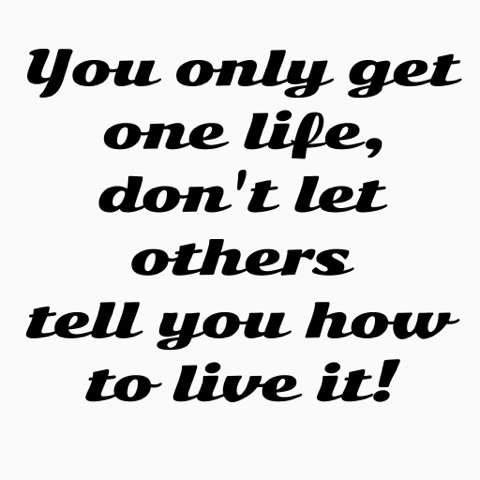 If you want to do something then bloody well go and do it, haters are always going to hate and you will always be on someone's wrong side but so what, we shouldn't be doing things to please others, as long as you and your family are happy sod everyone else! Very well said and I totally agree but after spending a life time being a people pleaser it is hard to let go! I am trying though. What annoys me is when people make uniformed comments or raise opinions based on wrong information. At least have something to base your opinion on!!! So so true! I think it's healthy to discuss opinions and people often find it difficult to understand that people have different opinions about life. Also agree with the above comments, its important to have the facts before making an opinion. Nicely said. One of the huge drawbacks of social media sites, you will always get people wanting to be a troll and cause bother. For every 50 for a thing there are another 50 against. I know it annoys my husband that I am medically obese, but have no issues with diabetes, high blood pressure, high cholesterol or anything else for that matter. he is 4 stone lighter than me and has all these issues. I eat healthy and do a lot of physical activity, he eats crap and sits on his lazy b*m most of the day, so who is healthier? I worried what people thought about me 20 years ago. now I dont give a toss, if somebody does not like me that is their problem not mine. Well said - it's when people think they have the right to comment on every little aspect. Breast feed, bottle feed, costless, cot sleep. How do they have time?? I know that the tax is an issue for a lot of people, but whether it will stop them? Did cigarette tax stop anyone?